Is it possible to be a little bit crestfallen? If so, I am. Disappointment, lemon tart is thy name. Oh, I was so hoping for fabulous, Dear Readers. I wanted to offer you a glorious sunny treat to illuminate these dank and dingy days of winter. I planned on a tangy citrus twist that would pucker you up in preparation for Cupid and all the amorous days ahead. I’d hoped for a silken, velvety morsel that would glide across your tongue before melting down your throat, arriving cozily in your tummy with lemony good cheer. I at least wanted to get what I was promised. 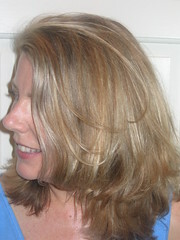 After all, I’d heard terrific things about Dorrie Greenspan and her fat cache of recipes, Baking, From My Home to Yours. 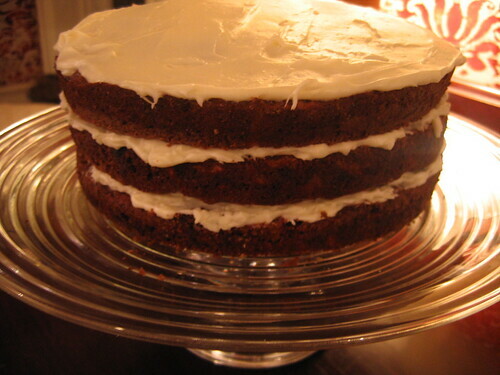 A week ago, I’d even tried her jumbo carrot cake, a dessert that practically required a forklift to hoist from counter to table. I’d been given the book as a Christmas gift and couldn’t wait to premiere one of the many pies and tarts featured within. The choice was easy. I’m a sucker for grand pronouncements and the cookbook’s build-up of this recipe (concocted by Pierre Herme, “France’s king of pastry”) was enormous. 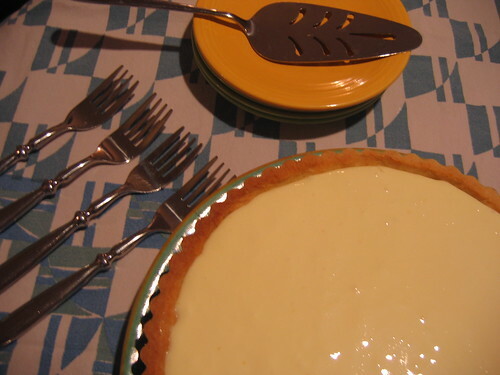 From its title: “The Most Extraordinary French Lemon Cream Tart” to Ms. Greenspan’s description of it: “the ne plus ultra of the lemon world. . .a stroke of culinary magic," the tart seemed to call out my name. How could I possibly resist? Or perhaps more accurately, how could I fail to be disappointed? Okay, I’ll admit that it’s not exactly bad. In fact, the King declared it very, very good. One kid nibbled at his slice until it was mostly gone, although there was no real enthusiasm present; the other tasted it and then scooped only the whipped cream into his mouth, announcing that he didn’t really like creamy tart-things anyway. I’d give it a grade in the range of B – tasty, if a bit eggy (yes, well, the filling does contain 4 eggs, duh) -- and frankly, a hell of a lot of work. I tend to resist concoctions that require thermometers and super-precise timing and temperatures. Just part of a general aversion to things numerical and mathematical, I suppose, but it preys upon my suspicions that my thermometer isn’t calibrated correctly and that the whole thing is going to flub. Predicting disaster, a friend calls it. Well, this recipe requires you to bring it to temperature not only once but twice. And then you whip it at high speed until the grinding noise of the blender nearly drives you mad and you imagine the machine’s motor threatening to smoke and blow up. (Predicting disaster, take two.) And even when that doesn’t quite happen, you can’t help but feel that niggling little sensation of doubt. And it turns out, you’re right. This, my friends, is certainly not the ne plus ultra of the lemon world. If you really want to see some fine specimens of Parisian lemon tarts, take a look at this post, “What is the best lemon tart?” from the lovely blog, Paris Breakfasts. The shocking news, though? The winner of that contest was the very same Pierre Hermes (co-creator of this week’s lemon tart). Quel mystere! For tart shell: Put flour, confectioners’ sugar, and salt in a food processor and pulse to combine. Add butter and pulse until butter resembles coarse flakes. Stir the yolk and add it a little at a time, pulsing. When the egg is in, process in long 10 second increments, until the dough forms clumps. Turn the dough onto a floured work surface and knead it lightly – just to incorporate dry ingredients. Butter a 9-inch tart pan with removeable bottom. Press dough evenly into the bottom and up the sides. Freeze the crust for at least 30 minutes before baking. When ready to bake, preheat oven to 375. Butter a piece of aluminum foil, press buttered side down against the crust. Put the tart pan on a baking sheet and bake the crust for 25 minutes. Carefully remove foil. Continue cooking for another 8-10 minutes, until golden brown. Transfer to a rack and cool. 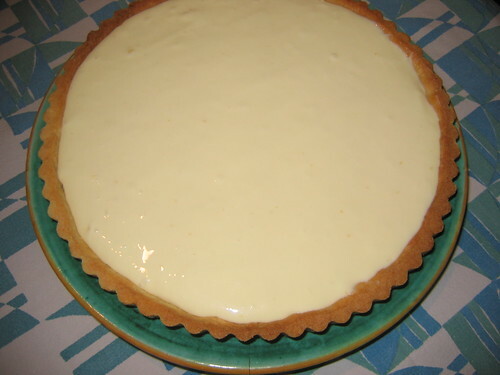 When ready to assemble tart, whisk the cream to loosen it and spoon it into the cooled tart shell. You are right. Far too much work. My mother's rule of thumb was that if something takes longer to cook than it takes to eat, it's not worth it. And that was long before any of us mere mortals owned microwave ovens. I think for desserts, one could safely double the rule: you can take up to twice as long to make as to eat. And for really, really good desserts, I guess you could multiply it by the number of people eating. Alas, this pie didn't appear to qualify as really, really good. And you are right, it's not just a matter of time, but how fussy the recipe is. I'm exhausted just reading it. I will confess that as a youth I did have a fondness for Hostess lemon pies. However, just thinking about one now sets my tummy on edge. Ahhh... the aftertaste of the "crust" that left the roof of your mouth coated like eating a spoonful of cheap store-brand shortening. That may have been a pure joy as a kid. I think it would have me running for the toothbrush today. Anonymous, We all have those dark food secrets. Mine (well, one of them) was Hostess Crumb Cakes. The sad truth is that I'd probably still like them today, if I ever allowed myself to venture down the Ho-Ho's aisle. . .
Made lemon tartlets for Valentine Day from Dorie and Herme and they were out of this world...all that butter!